What's The Difference Between White Eggs And Brown Eggs? We've all noticed the difference in price at the grocery store as we stand scratching our heads, but have you ever stopped to wonder what the difference really is between white and brown eggs? Most of us inevitably choose whichever eggs are on sale, or we just buy the color egg we've always bought. Well, it turns out there actually is a difference between white and brown eggs. The answer is so simple that you may be surprised. White-feathered chickens with white ear lobes lay white eggs and red-feathered ones with red ear lobes lay brown eggs (this may not apply to all breeds). 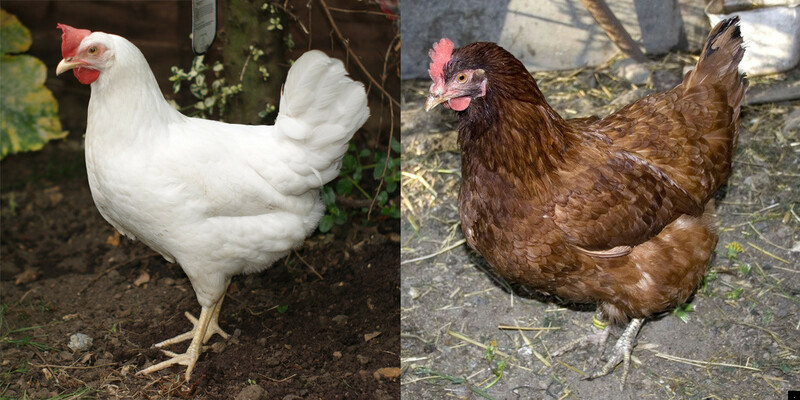 And besides that, there are certain chickens that even lay speckled eggs and blue eggs. But when you get down to the egg, nutritionally there is no difference -- it's all just in the looks. Why are brown eggs more expensive? Many people think that brown eggs must be better than white eggs because they're more expensive, but that's not the case. What makes brown eggs more expensive is as simple as size -- the chickens that lay brown eggs are larger than those that lay white eggs and thus their feed costs more. As a result, the brown eggs are priced higher. Is there any difference in the shell? Other than the color, there is no difference between the shell of a white egg and a brown egg. Some people make the assumption that brown egg shells are harder than white, but that's not the case. What's true is that younger chickens lay eggs with harder shells. Is there any difference in the yolk? Some people say that brown eggs have a yolk that's more richly colored than white eggs. The type of feed that chickens eat can vary, so the more corn they eat, the yellower the yolks. So it's not necessarily the color of the shell that predicts the intense color of the yolk. Which eggs do you typically buy? Leave us a comment below. See the slideshow below for some ideas on using eggs in your cooking and baking.